‘Tis the season! You’ll be getting a flood of cookies, cake and other sweet recipes. If you are here for a dinner idea, yesterday I made broccoli soup and the recipe is already posted for this dish. Check it out. Now back to `vasilopita’. 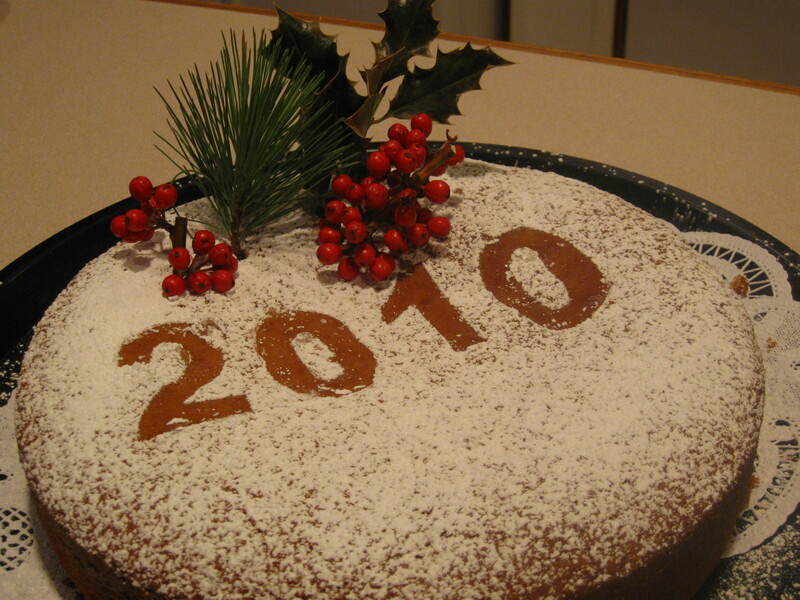 In Greece, we cut the `vasilopita’ cake on new year’s eve to celebrate the coming of the new year. We stick a coin in it and whoever gets it will get super extra lucky with money or otherwise in the coming year. There’s tons of `vasilopita’ recipes but they are basically of two types. The pound cake type that I’m offering here and the `tsoureki‘ type which is less sweet and more `bready’, made with yeast. The pound cake type is definitely quicker and easier. I made two of those last night. One to take to my son’s holiday celebration at school and one to take it to my work for a holiday get together. This is a really quick and easy and fun and yummy and everybody-in-my-family-likes-it recipe. Enjoy it decorated as holiday treat, as coffee cake, as fun snack for your kid or as just breakfast bread to dip in the milk. How to make: Beat butter with sugar well with the whisk part of your mixer until the mix becomes white and fluffy. Add eggs one at a time and continue beating. Add orange zest and vanilla. Beat for a few more minutes. Switch whisk to a bread part (I use the flat white part) and add flour one cup at a time. After you have added the first two cups, add the orange juice and then add the last 2 cups of flour. Blend at lowest speed until all the flour is folded in. Do not overbeat. Pour in a buttered pan and cook in pre-heated oven at 200 C or 400 F for about 50 minutes. Check with a toothpick. If it comes out clean, turn off the oven, take it out and let it cool. Use a sieve to sprinkle powdered sugar on top.